Exodus is arguably Bob Marley’s best solo album, track-for-track. Every song on the album is a classic, and its worst song (“One Love”) is a certified anthem with enough populist appeal it was used by the Jamaican tourist board. But even more than a collection of strong songs, the tunes on Exodus play well together. Like the best albums from the vinyl era, Exodus has a song cycle: the opener, “Natural Mystic,” perfectly segues into “So Much Things to Say”; “Guiltiness” and “The Heathen” pair up like Siamese twins; “Exodus” and “Jamming” go together like salt fish and ackee; “Waiting in Vain” and “Turn Your Lights Down Low” present a potent 1-2 combination of lover’s rock; and the closing duo, “Three Little Birds” and “One Love,” both go big with sing-a-long hooks. The songwriting is Marley at his best, ranging from introspective lyrics to extroverted projections of joy, happiness, and feeling irie. While not as raw politically as some of Marley’s earlier material, Exodus more than makes up for it with heartfelt expressions of love and humanism – which in of itself could be considered a political statement. Like the approximately 1800 other people who attended the three performances of Exodus commissioned by UnderCover Presents at the Independent this past weekend, Oakulture was curious to hear what Marley’s 1977 masterpiece would sound like reinterpreted by 10 local bands, encompassing a diverse stylistic range. The result broadened the album beyond the reggae genre and affirmed the universality of Marley’s message. Simply put, great material is great material, and it’s hard to go wrong with any of the tunes on Exodus. The fact that none of the performances presented by-the-numbers tributes allowed the performers to put their own touches on the songs, and keep things loose and somewhat quirky. This was no slick, Vegas-style production, but more of a representative sampling of the Bay Area music community—a funky, ad hoc bunch of talented weirdos. 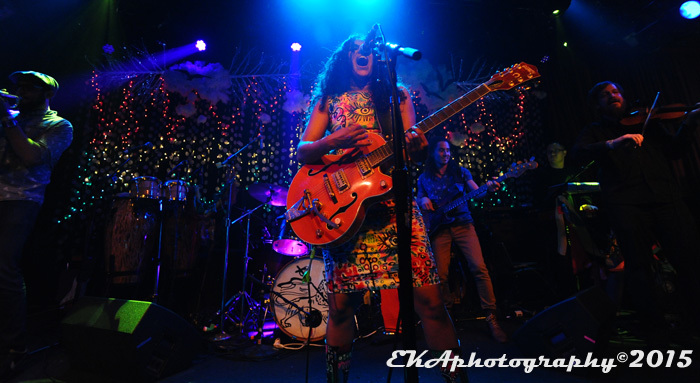 The show – and a companion album recorded at Fantasy Studios – were curated by Guest Music Director Rupa Marya of Rupa and the April Fishes, a world beat/alt.reggae band from SF. 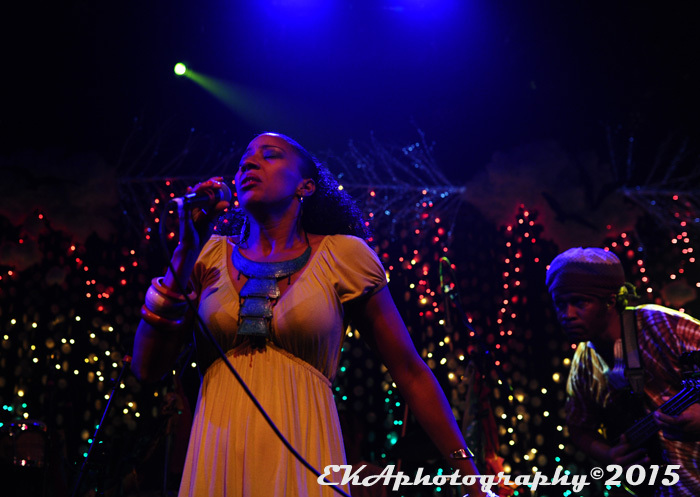 Marya clearly wanted to take the proceedings down an eclectic road, without getting too far away from the message of Marley’s music. 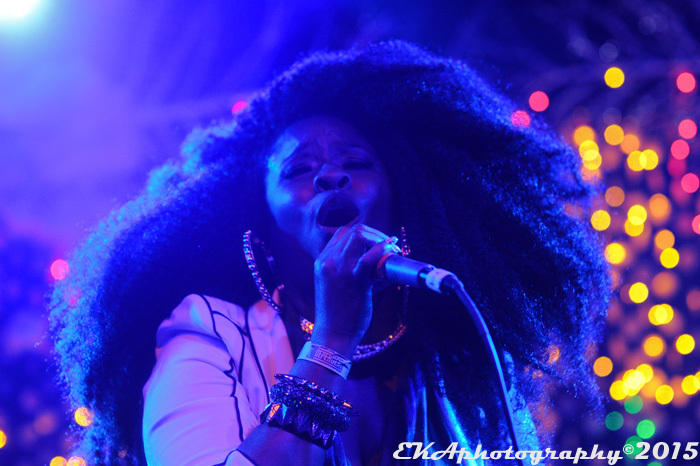 The standouts, from Oakulture’s perspective anyway, just happened to be Oakland-identified artists who infused their tunes with large doses of Afrofuturism. If you’ve ever wanted to hear the avant-jazz outfit the Broun Fellinis, a group known for their improvisational jams, tackle conventional song structure and feature a female vocalist, this was your lucky night. 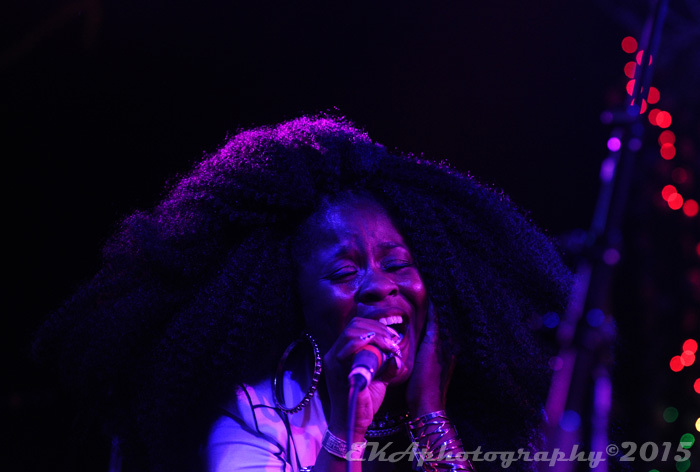 Femi Andrades, of the Punk Funk Mob, sang like she was possessed by a jazzy duppy on “Natural Mystic,” as original Fellinis Kevin Carnes (drums) and David Boyce (saxophone) and bassist Kirk Peterson raised a wailing ruckus. Another highlight was the surprise appearance of an unbilled Silk-E, who bum-rushed the stage along with the Coup’s Boots Riley and the Quartet San Francisco for a transcendent version of “Turn your Lights Down Low.” Sporting an enormous mane like a black lioness, Silk-E’s stage presence was just as big as her hair, to the point where Riley’s raps and the instrumental backing almost seemed like an afterthought. 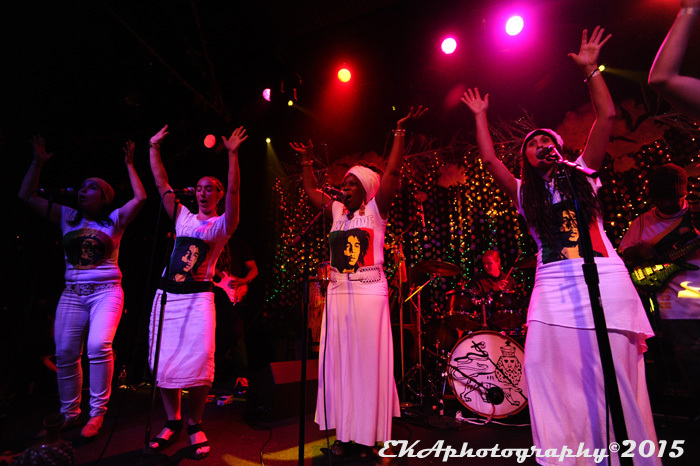 A nice touch was Empress Unification’s version of “Exodus.” The all-female vocal group, backed by the Fyah Squad Band, offered a refreshing take on the album’s titular track, with soaring harmonies which emphasized gender balance (reggae tends to be a male-dominated genre), while their all-white outfits suggested spiritual purity. 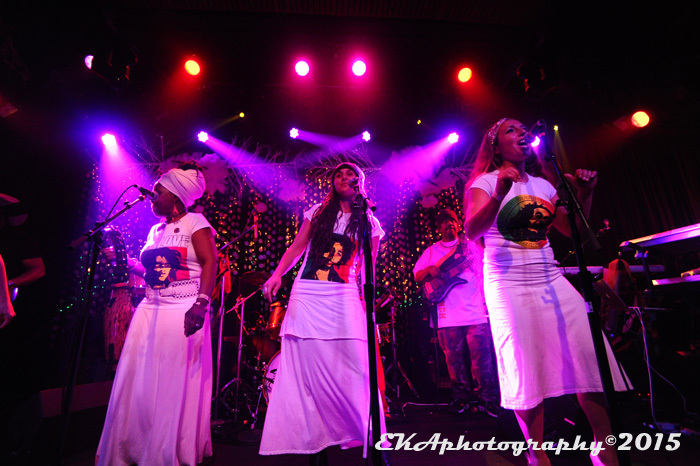 Marley’s back-up singers, the I-Threes, were always a huge part of his sound, and Empress Unification not only reminded listeners of that, but added two more voices to the mix. Sierra Leone Refugees All-Stars member Black Nature’s version of “Jamming” was probably the closest to traditional reggae out of all the performers, while vocal trio T Sisters put a doo wop spin on “Three Little Birds” and Brass Band Mission closed out the show with a NOLA-style second line rendition of “One Love.” Other participants included alt. 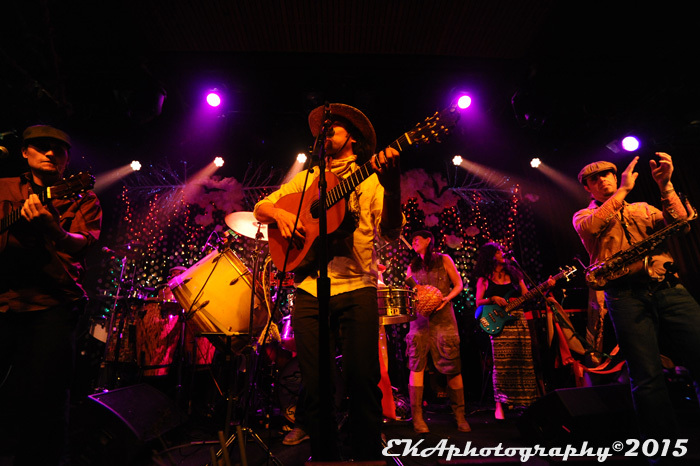 Latin band Shake Your Peace (“So Much Things to Say”), singer-songwriter Sean Hayes (“Waiting in Vain”) , and prog-reggae outfit FogDub (“Guiltiness”). Overall, Exodus added another feather to UnderCover Presents’ cap. 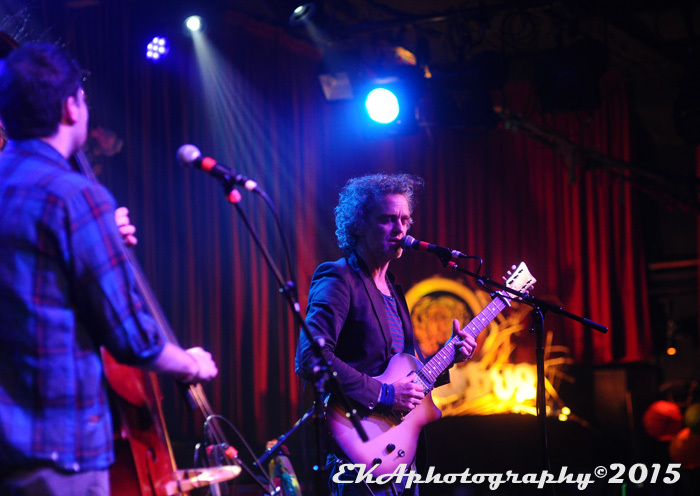 By offering musicians an opportunity to play some of their favorite tunes from one of their favorite albums, the show also helped expose those artists to audiences who may not otherwise have heard of them, and built community in the process. But perhaps the biggest testament to the production’s viability was the fact that the energy in the room started out high and just kept rising throughout. With SF’s music scene facing displacement of artists and the closing of venues, UnderCover Presents’ principal Lyz Luke isn’t just booking shows, she’s affirming cultural resiliency through creative placemaking. That’s something to appreciate in an age when the bus to Babylon is chartered by Google. 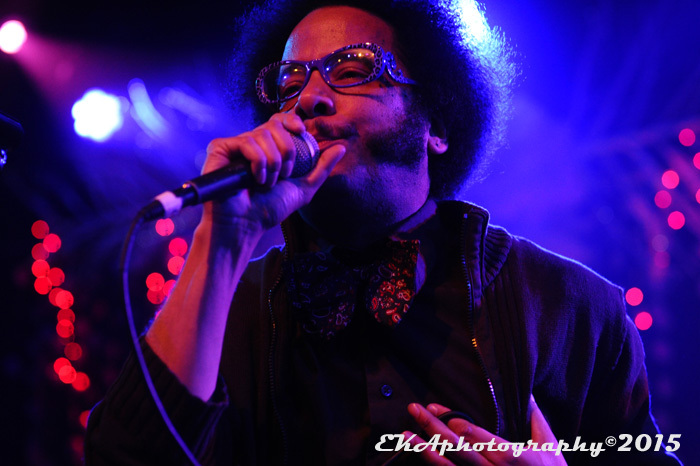 Categories: Live review, Music Review | Tags: Black Nature, Bob Marley, Boots Riley, Broun Fellinis, Empress Unification, Exodus, Femi Andrades, Lyz Luke, Rupa and the April Fishes, Sean Hayes, Shake Your Peace, Silk-E, T Sisters, The Independent SF, UnderCover Presents | Permalink.